I’m preparing the outline (syllabus) for one of the modules that I’ll be leading at York in the spring term–Cultural Heritage Management 2: Museums, Audiences and Interpretation. While most of that outline is finalised, I’m still trying to settle on the reading list for a class on ‘Heritage and the media’. A lot of the usual literature features in the list as it now stands, including Clack and Brittain’s (2007) Archaeology and the Media, and articles by Kulik (2006) on television and Pollock (2005) on newsprint. But in terms of scholarship on web-based media, I’m keen to flesh out the readings that I currently have listed, and I’m especially interested to include rigorous literature that is itself hosted online. I’ve mentioned before (here and in my list of links in the column on the right of my homepage) some of my favourite blogs and web-based knowledge sources, and I’d like to have students critically read the outputs of Colleen Morgan’s 4-week Blogging Archaeology project (which culminated in a Society for American Archaeology session), and the associated Then Dig peer-reviewed archaeology blog, as well as web-based journals like anthropologies, and the incredible Day of Archaeology. I’d also love to be able to recommend forthcoming articles (which are being published online or in academic print) that assess the public and epistemological impact of this work, not to mention of the media themselves (as applied by archaeologists and heritage specialists). I’m keen for suggestions, so please don’t hesitate to email me, contact me on Twitter (@archaeologistsp), respond here or via Facebook. Thank yooouuuu! Clack, T. and Brittain, M. (eds) (2007) Archaeology and the Media. Walnut Creek: Left Coast Press. Kulik, K. (2006) Archaeology and public television. Public Archaeology 5 (2): 75-90. Pollock, S. (2005) Archaeology goes to war at the newsstand. In Archaeologies of the Middle East: Critical Perspectives. S. Pollock and R. Bernbeck, eds. Pp. 78-96. Oxford: Blackwell. 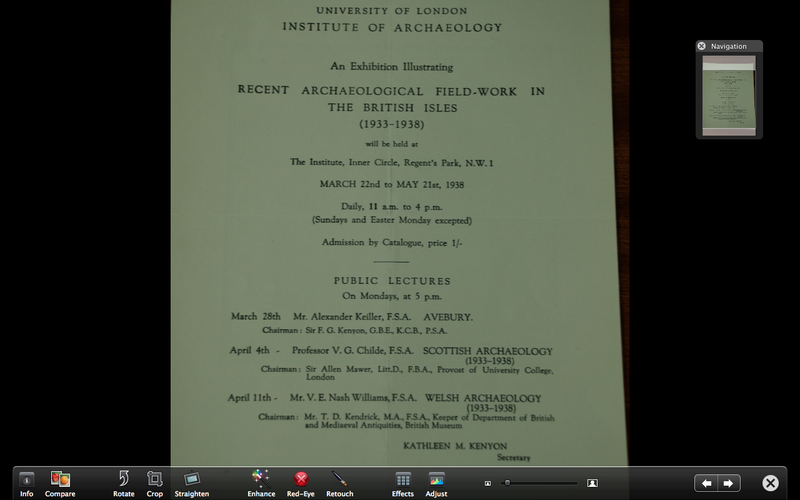 As I’ve mentioned before, my PhD research centres on the exploitation of visual media in the establishment of the first university departments of archaeology in Britain (circa early-to-mid 20th century). I’ve spent the last couple of years trolling through dozens of archives around the UK (everywhere from the Garstang Museum of Archaeology at Liverpool University, to the Society of Antiquaries, to the West Sussex Record Office, the BBC archives, and more), examining instances of visual artefacts & performances being manifestly — or tacitly — mobilised in the name of institutionalising the still-fledling archaeological discipline. My thesis ultimately focuses on such mobilisation in context of the Institute of Archaeology (IoA) at the University of London (incorporated into UCL in the mid-1980s). The example of the IoA is perfect for demonstrating the power of tools like temporary exhibitions, museological displays, TV, photography, and other two- and three-dimensional mediums for securing buy-in (i.e., financial, physical, intellectual, political and emotive support) for the creation and sustenance of university-based archaeology, not to mention the broader discipline overall. What is important is that, in the case of the IoA, although such media savvy is repeatedly attributed specifically to the aptitude (and ego) of the Institute’s first honorary director, Mortimer Wheeler, there is clear evidence to suggest that it is actually practiced quite independently of Wheeler both at — and before — the establishment of the IoA. Moreover, my research is making apparent the fact that, indeed, such savvy forms part of a strategic approach to discipline-building, rather than some kind of casual or narcissistic publicity posturing, as is often implied. Ultimately, what I think is critical about the pursuit of such enquiry is the potential relevance that it has for tactical media exploitation in the present. With this in mind, I’m interested to track down rigorous published or unpublished analyses of current archaeological projects’ publicity & mass media policies. There are various cases from the University of Southampton alone of the very effective application of, e.g., the web, television, radio and other mixed media, for the purpose of both internal and external positioning, but I know of these cases mostly anecdotally. I would thus very much appreciate reference to detailed analytical assessments of such on-the-ground media strategies — please don’t hesitate to email me!